One of my family's favorite shows on the Nickelodeon cable television channel is THE LOUD HOUSE. Debuting last May, The Loud House quickly become one of Nickelodeon's most popular shows of 2016. The animated series features Lincoln Loud, the middle child and only son out of eleven children in his family, dealing with the chaotic and comedic moments of a boy living with ten girls. Catch up on past episodes of The Loud House on New Years Eve before brand new episodes premiere in 2017. 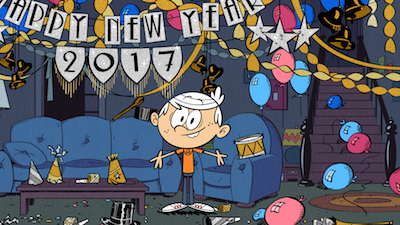 Join The Loud House’s Lincoln Loud in ringing in 2017 during Lincoln Loud’s Ultimate Year End Countdown-a-thon, a marathon featuring encore episodes of and custom videos, Saturday, Dec. 31, from 8:00p.m. (ET/PT) to 12:00a.m. (ET/PT) on Nickelodeon. Throughout the New Year’s Eve marathon, brand-new short videos will showcase Lincoln revealing his favorite pranks, pets, missions, food, and lessons learned in 2016. Additionally, Lincoln will countdown to the new year before the clock strikes midnight. Then tune into Nickelodeon in the new year as The Loud House returns with all new episodes beginning Monday, Jan. 9, at 5:00p.m. (ET/PT). In the first new episode of 2017, “Suite and Sour,” Mom and Dad win a trip to a resort and decide to take the kids – but only because the Lincoln and the girls promised to behave. How do you think that is going to turn out? For more information about this TV series visit the The Loud House page on Nick.com and the Nick App to get a behind-the-scenes look at the series and the brand-new Facebook page. On Instagram, fans can also experience The Loud House Instacomic, an interactive, digital comic book allowing users to help Lincoln Loud on his quest to find the missing remote control. Check it out @loudhouseinstacomic.